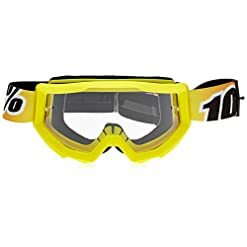 Like disc brakes and suspension, goggles are as essential to mountain biking as they are to motocross. But, all-too-often, mountain-bike-specific goggles overlook the importance of tear-offs. 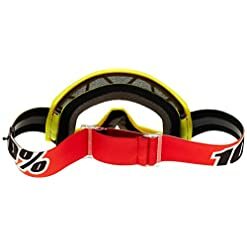 Thankfully, all 100% Goggles, like the Strata Goggles, include tear-off tabs. Finally, the proper integration of technologies. 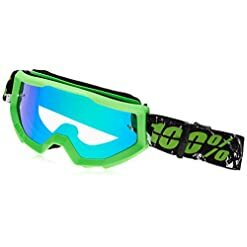 100%’s philosophy on compatibility makes the Strata goggles one of the best values on the market. The lenses are interchangeable with 20-plus aftermarket lenses, and all tear-off accessories including roll offs. From the Strata to the top-of-the-line Racecraft, you can receive the same level of visibility that motocross racers demand. The Strata frame’s feature a urethane construction that’s both durable and flexible. As for shape, 100% designed the frames with an anatomically conforming curve that’s at once comfortable, without detracting from your field of vision. Residing between you and the Strata’s chassis is a dual-layer foam that’ll comfortably fit your face’s contours to lockout dirt. It’s also designed to pull perspiration away from the skin and quickly evaporate it. This means a few things — less funkiness, a reduction to chafing, and a no more steamy lenses. 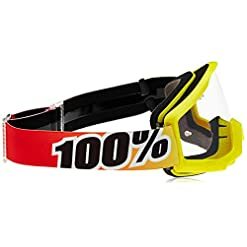 The 100% Strata Goggles are available with a Clear Lens and in the frame colors Black Lime, Black Mandarina, Blue Lagoon, Fire Red, Ice Age, and Sunny days. 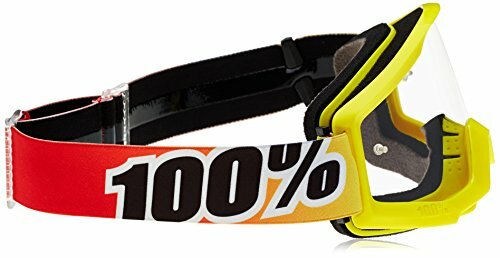 Every pair of goggles come with an anti-fog Lexan lens and a 40mm wide strap that’s coated with silicone.